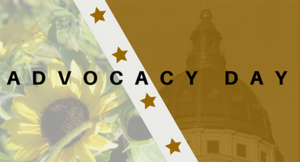 We are ready for 2019 Advocacy Day! If you have not already made plans to join us, please sign up today! Reception at Dillon House 5:45 – 7:30 p.m.
As you prepare to attend Advocacy Day, you are encouraged to make appointments to visit with your state Senator and Representative. The schedule has time built in between 1:30 – 2:45 p.m. for you to meet with them. Find your elected officials. Registration is FREE for residents & students; $30 for members and $60 for non-members.